Winter breaks in Alpine ski resorts are very fun but not always so relaxing because of noisy neighbors, endless ski-lift queues and crowded (ski) slopes. Urban dwellers (and dog lovers) looking for alternative nature break in the French Alps should think about taking a day off (or two) in January to see the now famous high-altitude sled dog stage race known as La Grande Odyssée: A refreshing (potentially windy) off the beaten track winter experience. Megève is considered as one of the most luxurious ski resorts in France with upscale shops, hotels and restaurants attracting wealthy tourists, only two hours from Lyon. The beautiful and still authentic village is also one of twenty winter sport alpine resorts to host La Grande Odyssée, the only high-altitude sled dog race. 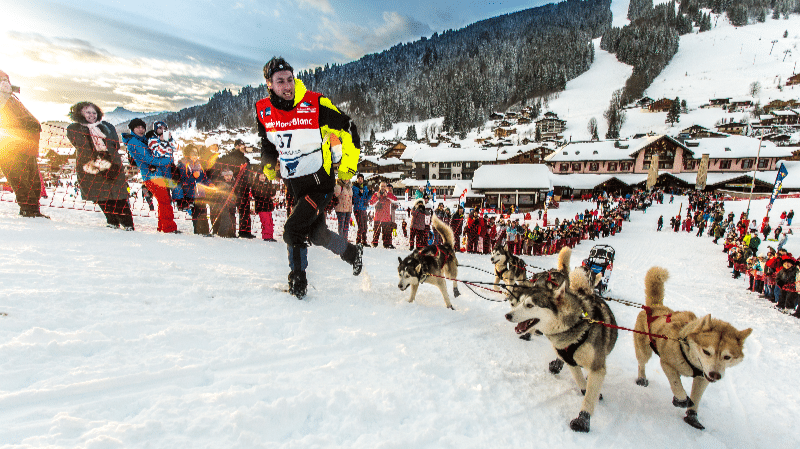 The 14th edition of the 800-km trail across the French Alps kicks off on January 13: a 11-day sporting adventure for dogs and mushers, a unique experience for nature and mountain lovers when winter vacationers and jet-setters have not moved to the village yet. La Grande Odyssée is a very festive and family-oriented event with a series of animations in stage town. The 80 000-plus visitors can watch the race in real time on big screens, have a piece of potato, bacon and cheese tartiflette with a glass of hot wine and cheer mushers as they cross the finish line. The parade of mushers in villages and the mini’s kids-only sled dog race (January 16) are worth seeing too. Nothing wrong about that but a little bit frustrating. If you are looking for an authentic experience, you can make your own alpine trail to see mushers in action up close while enjoying the mountains silence. “Nature lovers can reach stunning viewpoints by foot, snowshoe, alpine or cross-country ski with a guide or their own”, says Annabel Lascar, the race’s communication director. Die-hard explorers should consider joining the mushers’ 2000 m high bivouac on January 20. “We take tourists on a nightly ski left ride to the so-called Polar Base near Mount Cenis Lake (Haute-Maurienne Vanoise massif). It’s a magical extraordinary moment to live for first-time visitors as they admire scenic mountain landscapes around them and observe the sky full of stars”, says Eric Jagorel, director of Le Grand Val-Cenis VVF vacation village. The experience is a little bit more challenging for mushers who must feed and take care of their dogs under severe winter weather conditions. 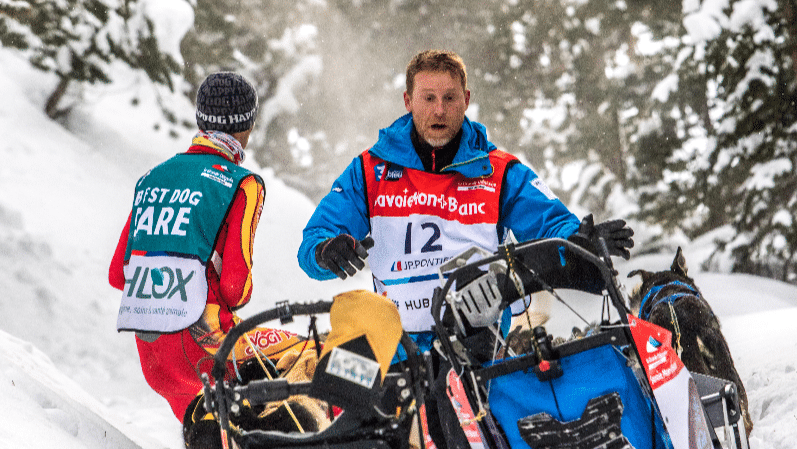 “Sleeping in a tent when temperatures are 20 degrees below zero is not the best way to recover from an exhausting (physical) effort”, says last year’s third-place finisher Daniel Juillaguet, amused. The 30 mushers competing in one of the races of La Grande Odyssée (long-distance, mid-distance and 4-day races) must be in an excellent physical shape as they run with their ten dogs, push on the sled, wave the stick to guide them while deal with a change in altitude of up to 25 000 m.
“These sled dogs have become world-class athletes with a vVO2max (velocity at maximal oxygen uptake) three times higher than human best performers”, says Thibaut Branquart, the race’s sports manager. The close relation mushers develop with their dogs is what makes the difference between the first teams which are usually separated by less than a minute on the finish line. Mushers are very closed to their dogs. That’s an even more determining factor than the average speed (20km/h) or the cold resistance according to organizers. It’s also what Daniel Juillaguet likes the most about the race. “I love to share an effort with my dogs, running with them, helping and encourage them with my voice”, the French musher told This Is Lyon. The 50-year-old physiotherapist has participated in every race since its creation in 2005. Sportsman and dog lover, he was caught of passion for such an unconventional outdoor activity after a biking trip to Norway where he met a musher and his dogs. Juillaguet spends six hours a day with his twenty Alaskan husky dogs, which can run fast and for a long time. Training sessions average a 50-km trail. “These dogs are very receptive, obedient and they are able to anticipate. My dogs know me like no other though the relation needs to be strengthened all the time especially with the lead dogs”, he adds. 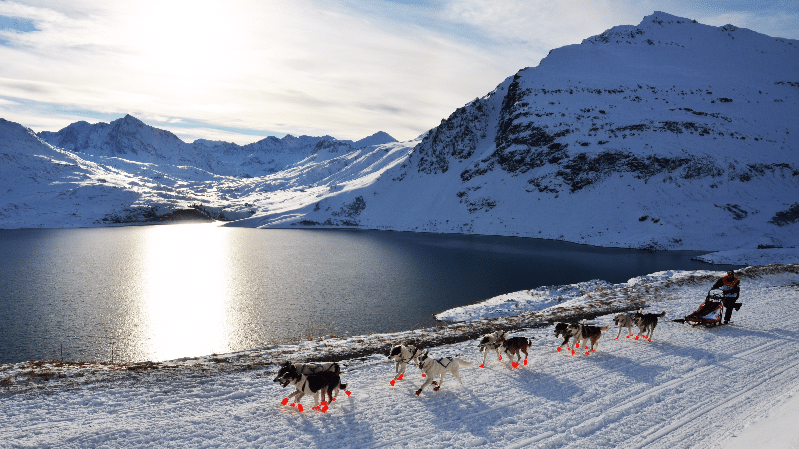 For visitors, La Grande Odyssée is an authentic journey through time and space as sled dogs were used as a means of transportation for centuries until the introduction of snowmobiles in the early 20th century. Then came the first races. A highly recommended nature break in the heart of French Alps two hours from Lyon. 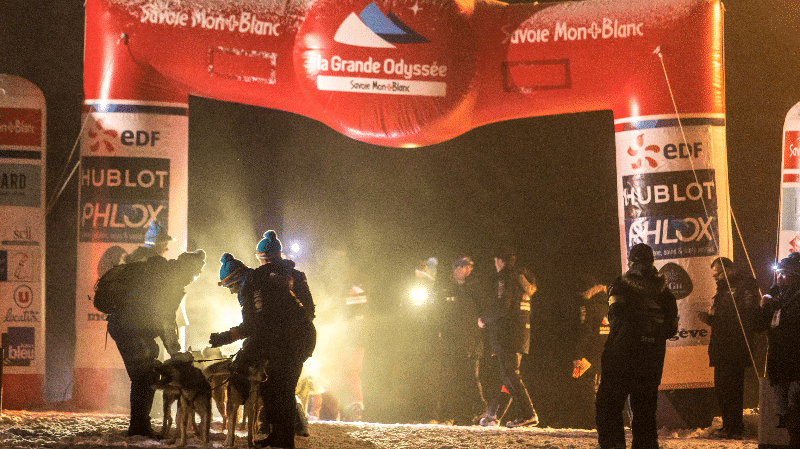 La Grande Odyssee – January 13-24 – Sled Dogs Trail in the French Alps – Most stage towns are less than two hours from Lyon. Check out the detailed schedule here.